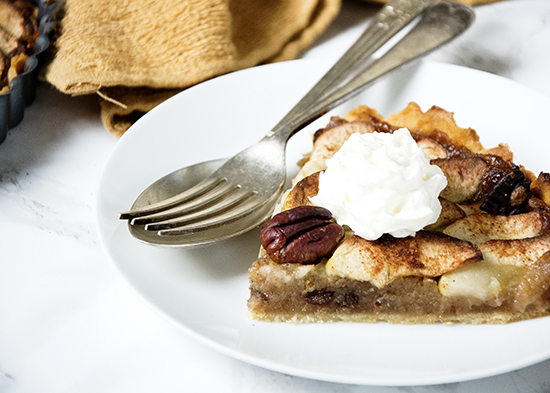 Spiced apple and pecan tart. I don’t make tarts very often but I recently bought my first tart tin rather than relying on ready-made cases, so I felt the need to use it. A good tart tin is a must-have in any bakers kitchen, the one I use is available here . 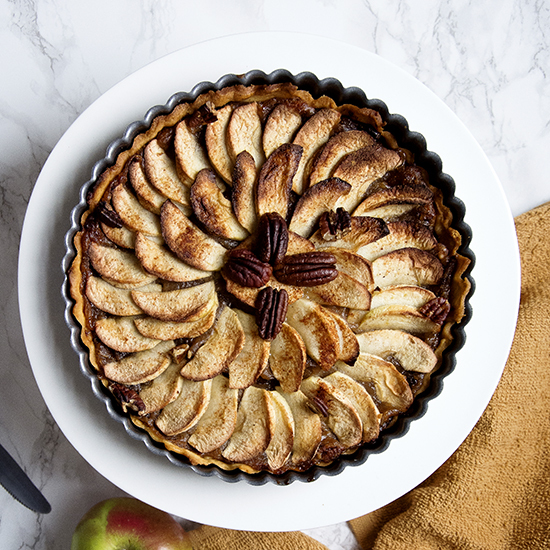 I didn’t want to make a standard apple tart as I was also making apple upside down cake and apple cupcakes and I was feeling a little fed up with apples after eating a whole tree’s worth in a few weeks, so I needed to spice things up a little. The filling for this is interesting as it combines apples, raisins and amaretto to give a lovely kick. It is essentially one of those recipes that you can really make your own, its a throw whatever you have in your cupboards kind of recipe. Tarts are a fantastic alternative to a cake or a pie, they always feel so much more special and sophisticated. This recipe would be a welcome addition to any afternoon tea or to spice up your dinner party. 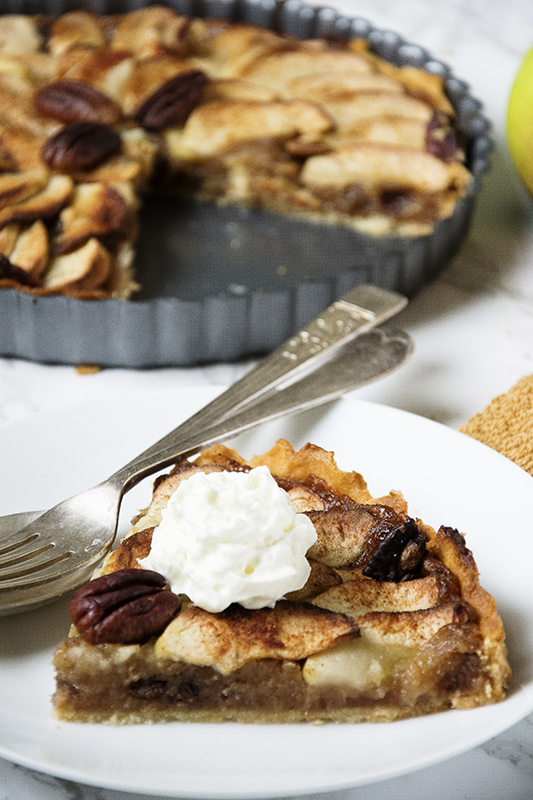 Serve my spiced apple and pecan tart with either cream or custard and you have a beautiful autumn dessert that is sure to impress every time. Note: I use ready rolled pastry, it’s easier for me, if you would like to whip up your own pastry that’s fine. Preheat your oven to 190C, spray a 10″ tart tin with non-stick cooking spray. Roll out your pastry on a floured surface, roll the pastry onto a rolling pin and transfer it to the tart tin. Using your hands, gently push the pastry into the tart tin, line with a piece of baking paper and fill with either dry rice, beans or baking balls. Bake in the oven for 10 minutes until just starting to turn golden. Baking balls available here . Whilst the tart is blind baking you can prepare the apples, peel, core and chop 2 of the apples into 1cm chunks. After 10min remove the tart from the oven and place on a wire cooling rack whilst you prepare the filling. Melt the butter in a medium pan on medium heat. Add the apples and cook for 10-15min until the apples have softened, once the apples are soft using a potato masher or the back of a wooden spoon, mash up the apples. No need to completely puree them just remove most of the large chunks. Return to the heat and add the spices, pecans, raisins, sugar, flour, cornflour and amaretto. Reserve a tablespoon of sugar for later. Cook the mixture over medium heat for another 10min stirring regularly until the sugar has melted and everything has combined. Remove the filling from the heat and leave to cool. Whilst cooling prepare the remaining two apples. Peel core and slice the apples into thin slices, about 2mm is fine. 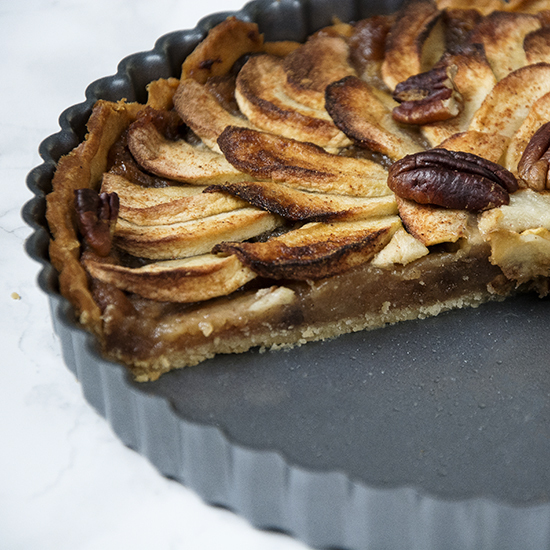 Once the filling is cool, transfer it to the tart case and spread evenly, arrange the apple slices on top in a spiral pattern, sprinkle with the leftover sugar and pecans. Bake for 30-40 min until the apples have turned golden brown. Remove from the oven and leave to cool on a wire cooling rack. Serve with cream or custard. And there you have it, a beautiful spiced apple tart. If you give this recipe a go let me know how it goes by tagging @whatseatingmanchester in your social media post!